Elementary students range from approximately 4th through 5th or 6th grade ages. Our upper elementary classes reinforce the foundation laid in our lower grammar level courses, and emphasize quality written work, legible penmanship, accuracy in spelling, reading comprehension, vocabulary acquisition, memory work in all subjects, appropriate classroom behavior, self-discipline and self-control. Focus includes literature, poetry memorization, handwriting, spelling, vocabulary, dictation, and the mechanics of grammar and writing. A love of language is encouraged in students through a variety of experiences and projects. Students will continue to learn literary terms and devices in the context of enjoying excellent literature. 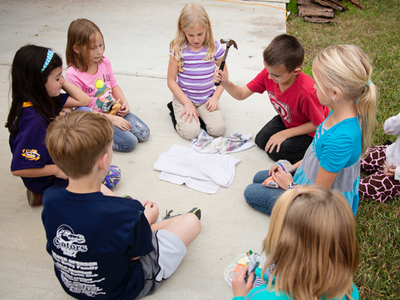 Our elementary level science classes are engaging and hands-on. We utilize the Apologia series on a rotating basis, and all elementary levels study the same topics each year. Students read and interact with texts and journals at home, provide narrations and presentations in class, and complete labs during class on Liberty campus days. Our curriculum utilizes creative instruction to help every student develop a love for art and a healthy self-image in a way that emphasizes the value and talent of each child. Students will move through units that explore the main elements of art: texture, form, space, shape, color, value and line, while navigating through artwork of some of history’s masters. Our Latin classes at this level increase vocabulary exposure, focus on reading comprehension, and begin introducing grammar, utilizing elements to engage students of every learning style. As a step beyond just an exposure to the language, it trains students in grammar, vocabulary and English derivatives in a lively, interactive way that is perfectly suited to students in the grammar stage. Our curriculum provides a comprehensive continuity program from kindergarten through grade 6, with a strong emphasis on the fitness component. It is based on sound education principles, research in motor learning, exercise physiology and teaching methodology. Each P.E. class will last 30 minutes and will consist of an opening warm up or stretching activity, a main activity that teaches a sport, fitness or game skill and a closing activity. Elementary D students will continue learning math concepts and strategies via Everyday Math while continuing the math program of choice at home. Elementary E students will receive instruction in their appropriate level of Saxon Math, beginning with Saxon 5/4.